Joints can be used to connect bodies with each other. Either you connect two rigid bodies or a rigid and an animated body. This connection happens in a way that the bodies' position is not absolutely fix (relative to each other) - this was better done with multiple geometries in one body. 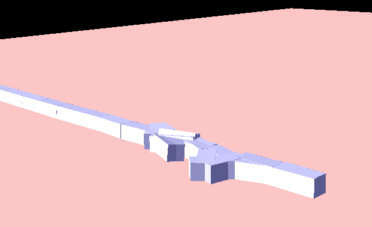 Joints instead allow a certain movement relative to the other body. A simple example for a hinge joint can be found at your car's engine hoot. Ball and socket joints are in action at your wrist: You can turn your hand in all directions - with limits, of course. If you download the project and extract the files, you will see some files which you got to learn in the previous tutorial. The JointSimulation.cpp doesn't really differ from the SimpleSample.cpp of Tutorial 1. It just declares a variable of another class (no longer SimpleTokSim but CJointSim or CJointSimSample1, see l. 48-50). There is nothing special about this file anymore. The other two cpp-files contain two different joint simulation classes. One which I will use to explain the joints (JointSim.cpp) and the other one, which is more or less the Tokamak sample 1. But as the base class CTokSim does the display task for us, the code is a bit clearer, i think, than in sample1.cpp from the Tokamak demos. And you do not have to get several libs to compile it. In order to learn how the two different joint types work, let's create a simple scene with both types. 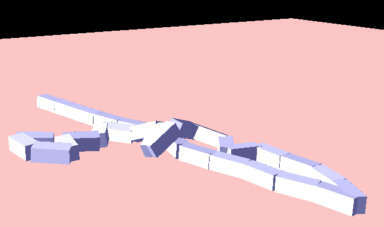 At first, a joint is created using the m_Sim member variable of the base class. This is the Tokamak simulator. As parameters we pass the two bodies we want to connect. The next lines seem to be a bit weird - but they are not. 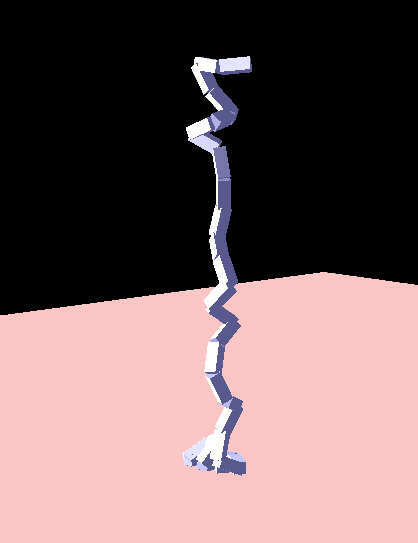 The last line of this block (joint->SetJointFrameWorld(trans);) sets the so called joint frame. The suffix "World" means that this is done in world coordinates. You also have the possibility to use the coordinate system of body1 or body2 - use SetJointFrameA/B() then. The frame contains the information about where the joint is created (we wouldn't have to create it at the edge where the body touch each other - we could choose another axis) and - only for hinge joints - the direction of the joint axis. So the position is simple - the point in the middle of the joint axis is (0,15,5), so this is trans.pos. What about the rotation? Our joint shall be parallel to the x-axis. In identity matrix would mean that it is parallel to the y-axis. The rotation matrix above maps the vector (0,1,0) (y-direction) to (1,0,0) (x-direction) - it is a simple rotation matrix. Now it gets easier again: the next line sets the joint type NE_JOINT_HINGE. Then there are three lines which set and enable the joint limit. What is this? As I mentioned in the introduction you can turn your hand only within certain limits (otherwise you should maybe visit your doctor :-)). So this is the case not only in ball and socket joints but also in hinge joints. You can define a lower and an upper limit. The angle (radian) between the two bodies will always stay between these two limits. Our two boxes shall have quite a big angle interval. They may rotate 90% of a half rotation in each direction. If you would set the limits to -PI and +PI, they would seem not to collide. Indeed - they do not collide, which is intended. Otherwise they could not even rotate a little bit around the joint axis, because they would collide at once. (Note that the CollideConnected value does not have to do anything with this. See the Sample 1 short explanation). As we have set the position and direction of the joint (using SetJointFrameWorld), we also should set the length of the joint. If we imagine the boxes to be completedly connected, we set this to the length of the edge (10.0f). The last line is probably the most important one: you always have to enable the joint, otherwise it will have no effect! That's all you need to create a hinge joint! So let's look at a ball and socket joint. Imagine a sphere "hanging in the air" - an animated object. Let's add a box which touches this sphere. If you use a ball and socket joint - this touch will always stay. //create a fixed sphere "hanging in the air"
Looks very like the code for the hinge, doesn't it? It's even easier: The joint is created with the same call to CreateJoint(), then we set the joint frame - the rotation matrix doesn't matter for ball and socket joints. So set it to identity. As position we set the center of the sphere! 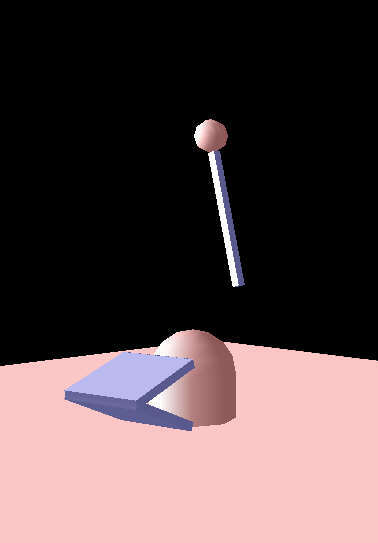 If we would set the touching point, the box would rotate arount this point on the surface of the sphere. Then we set the type of NE_JOINT_BALLSOCKET. You can also add a limit for ball and socket joints, but instead, I want to introduce the joint damping. It's easy to understand - the higher this factor, the stronger the damping. It looks a bit strange, that the box doesn't stop moving when it is hanging exactly under the sphere in our case here, but this is one result of the damping - I have not found a way to solve this. Please consider that you see the box only rotating around the z-axis. If you would apply impuls to it in z-direction you will see that this is really a ballsocket! Providing this file I wanted to show how simple it is to compile Tokamak's samples using my CTokSim class. It creates several boxes and connects them with ball and socket joints. The first image has been created with CollideConnected(false), the second with CollideConnected(true). In the first one the boxes didn't collide correctly - in the second, they did! set the accuracy of the joint.